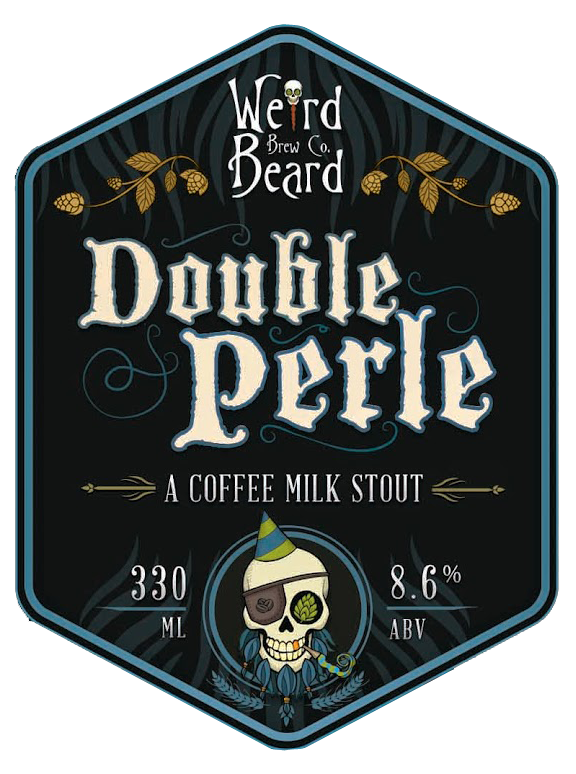 “When it came time to brew our 100th brew at Weird Beard Brew Co. we decided we should do something special to celebrate. We threw around a few ideas of interesting and some downright insane beers, but decided we didn’t need to venture too far from our roots and would brew a bigger version of one of our core range. Black Perle was an obvious choice, not only because people been requesting we amp this one up for some time. It is one of our original beers that pre-dates Weird Beard itself. Back in the days before Gregg Irwin and I started the brewery and were just two home brewers giving out samples of prototypes at bars and festivals, it was a firm favourite. A firkin of Black Perle was the first beer we ever sold from the brewery and the beer we debuted with. It is the first beer I ever bought in a bar that I had made. I remember sitting anonymously at the bar watching and listening to people enjoying it, so Black Perle will always have a special place in my heart. Double Perle is essentially the same recipe as Black Perle with just a few small tweaks and a lot less water. This concentrates all the flavours we love, but makes it a bigger, more luxurious experience.